HIP X-RAY EXAMPLES the one below is 90 degrees, with knees and clear acceptable. by our exclusive guarantee which is the best available replacement guarantee in the world. Shipping is the responsibility / cost of the owner to or from Alpine K9 and/or Jinopo. will be registered or registrable fully and without restrictions by AKC. dog of equal value at no charge. If your dog has been properly immunized and then dies or is crippled by distemper, hepatitis, or leoptospirosis within 12 month after purchase, return all the papers and we will replace dog of equal value at no charge. 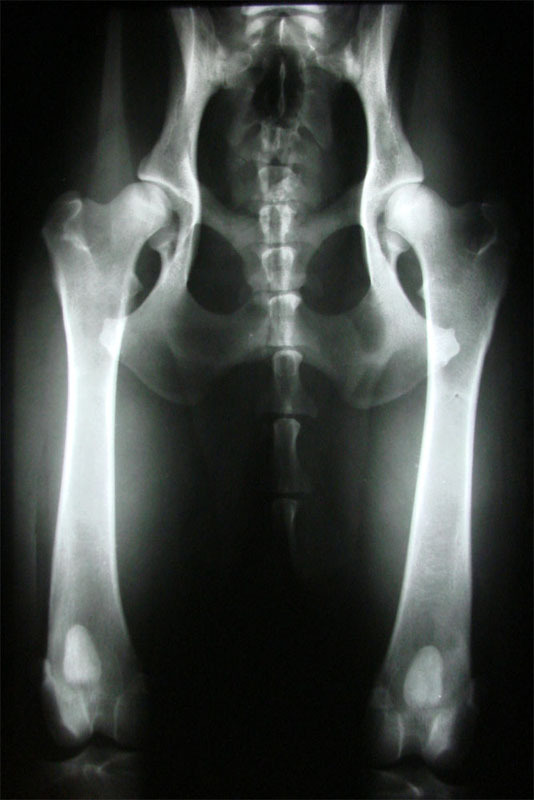 If at any time during the time of 2-2.5 years of the dog's age or within 30 days after the purchase date (if the dog is older then 2.5 years old), the dog is found to be crippled from Dysplasia and or OFA evaluation of hips is HD1-3, then return the dog to Alpine K9 along with all the papers and we will replace the dog with a dog of equal value at no charge. You may possibly keep such dog (decision of Alpinek9) if you provide us with proof that the dog is dysplastic. Before the x-raying of the dog for elbow or hips dysplasia you must contact alpinek9 for pertinent ID details of such dog. If your pup has been properly immunized and if your pup dies from parvo virus, return all papers to Alpinek9 along with laboratory verification or veterinary verification and we will replace puppy with puppy of equal value at no charge. or fetal state or if genetic condition is of hereditary origin, return all papers and the dog to Alpinek9 and we will replace the dog with one of equal value at no charge. This guarantee applies to the original buyer of puppy/ dog and is not transferable The puppy / dog must be in good condition. You own the puppy/dog as soon as the deposit is received. After the deposit is paid and in the event the BUYER either defaults in the payment of the entire purchase price or elects to cancel this Agreement, all monies paid pursuant hereto may be retained by SELLER as liquidated damages and no further action shall be maintained by either party. On the other hand in the event of default by SELLER herein BUYER'S soleremedy shall be to rescind this Agreement and receive the return of any funds paid to the SELLER or directly expend on shipping of the dog here under. No replacement will be given if the dog (male or female) has been bred, neutered, spayed, sold or the dog/pup is not paid in full. (This is to protect our beloved GSD breed from being destroyed by buyer who would breed genetically defective dog , profit from it and then ask us for replacement.) Warranty is also void if the dog had been abused. The guarantee is void if registration application form has expired or kennel name had been changed. Please understand that NOT all dogs are sold with AKC or other registration. The buyer will be clearly advised in advance of purchase if the dog is not registered or registrable with AKC or FCI. In that case the paper are non existent and the buyer does not need to return such in order for this warranty to be fulfilled. Warranty is Void if malicious, insulting or negative posts or articles or ads about the dog/puppy in question or of AlpineK9 and any related associates and any other dogs/puppies owned or sold by AlpineK9 or related Associates are published on any website, forum, blog, or disseminated by any other method on the Internet or any other media. Owner is responsible for transportation cost to and from Alpinek9 or Jinopo kennel. If, when purchasing or returning a dog, the shipping is not paid for by Buyer, the warranty shall be void. Guarantee is void if the dog has not been properly immunized by "PROGUARD" manufactured by Intervet or by shots manufactured by "PFIZER". HIP X rays intended for OFA registration MUST BE APPROVED BY Alpine Safety K9 International BEFORE they are sent to OFA for evaluation. 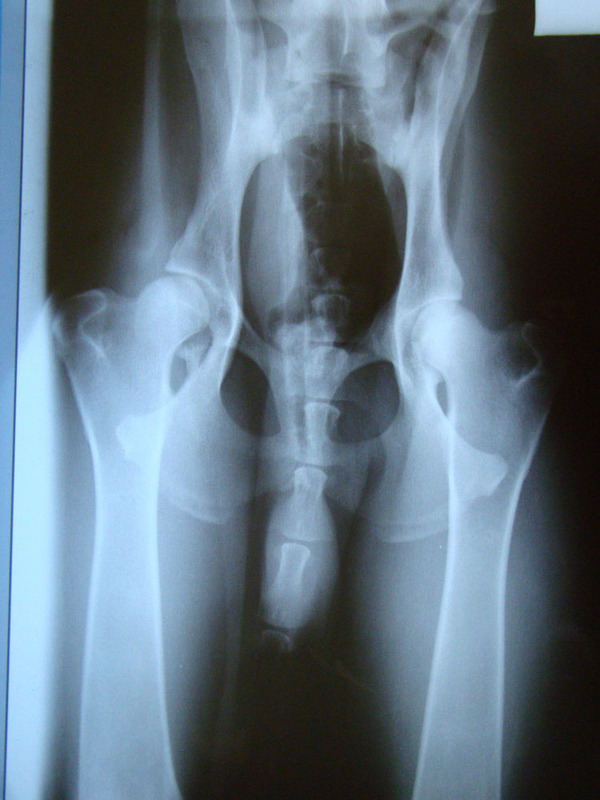 Only this x ray will be considered by Alpine Safety K9 International as the proof of HD (hip dysplasia). (This is necessary because too many people are sending improperly taken x ray to OFA for evaluation, which then leads to lower grading of hips by OFA). OFA decision then is final and will not be disputed. The cost of x raying and all other veterinary services is the buyers responsibility. In case the identity of the dog presented is in question the dog then must be sent for x raying to Alpine K9 location for such x raying at the cost of the buyer. Dog has tobe positively identified to us by our tattoo or by microchip. If neither is present then please contact us for further instruction BEFORE you take the dog for x-ray to the vet. There is video of performance of the dog provided with purchase of each dog and / or dog is inspected/tested/demonstrated before sale to the buyer. To make the trained dog to work as presented on the video or as it was presented to the buyer in person is a sole responsibility of the buyer. AlpineK9 provides Handler's course at least for 4 days or until handling ability is obtained by the buyer. Handler's course is free at Wickenburg AZ location or dog can be delivered for a fee and cost anywhere in the world. Dog should not be purchased if video or personal presentation is not acceptable to the buyer. Obviously buyer's ability to handle this trained dog is not guaranteed. Purchasing of the trained dog without handler's course is not recommended. The dog will be replaced by a dog chosen by Alpinek9 with a dog of equal quality and value, as soon one is available. In the event buyer either defaults in the payment of the entire purchase price, or elects to cancel this agreement, before the dog is shipped, all monies paid pursuant hereto may be retained by seller as liquidated damages and no further action shall be maintained by either party. Warranty is replacement warranty ONLY, in case the dog has been returned for reasons listed in these points *AKC WARRANTY, * LIFETIME TEMPERAMENT WARRANTY, *12 MONTHS HEALTH WARRANTY, * GUARANTEE AGAINST HIP DYSPLASIA, *12 MO PARVO VIRUS GUARANTEE, * 12 MONTHS GUARANTEE AGAINST CONGENITAL AND HEREDITARY DEFECTS, thus in these cases no money will be given back. By purchasing a pup/dog from AlpineSafety K9 International I fully agree with this warranty. I understand that If you absolutely insist on the money back for the dog, then there will be minimum 50% deducted as a "restocking fee". The size of the percentage will be and is based on sole decision of Alpine Safety K9 International based on the situation. There will never be a financial compensation for the shipping cost and there will never be money back given if the agreement is canceled ( see the section on cancellation of the agreement below). In Europe it is customary that the breeder names the pup. Every litter has the letter from which the name of the dog starts and then comes the name of the breeding kennel. This is important to a breeder like me for organizational and recognition reasons. Thus I firmly believe that the breeder should name the dog. Here in USA AKC gives the right to name the dog to the dog's new owner. That leads to problems because people omit to use the kennel name and or start the name with the wrong letter of particular litter. This could be remedied by me registering the pup by me ( as the first owner) at first in my name and then I can give the name to the dog and then transfer the dog with such name onto you. However I can just bypass that step by asking the new owner to email us the name which they prefer and which is starting form particular litter letter which we will provide you up on request. However if we do not receive the name of the dog from you then we provide our own name. I just want to make sure, and all we really care about, is that the name starts from the particular letter and has "z AlpineK9" there on the end. I would also like to add that majority of dogs in Europe have official name (given by the breeder) and call name (given by the owner). Here is an example of my personal dog "Haio" which was named Fram z Jirkova dvora by the breeder and then named Haio by me. Superior Service and Working German Shepherd Dogs for a reasonable cost based on: TRADITION, QUALITY, EXPERIENCE.